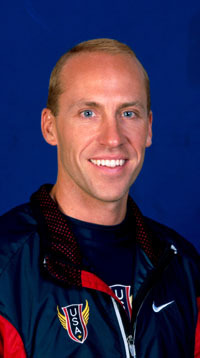 Jason Pyrah was a member of the USA Olympic Track and Field team for the 1996 Olympic Summer Games in Atlanta and the 2000 Olympic Summer Games in Sydney. He competed in the 1500-meter run; he did not qualify for the final in 1996 but placed tenth in the 2000 Games. Pyrah was born on April 6, 1989, in Springfield, Missouri. He excelled in track and field during high school in Willard, Missouri, and was state track champion six times. At one time he held four Missouri state track records, two of which he still holds. At Brigham Young University, he was a four-time NCAA track and two-time NCAA cross country All-American. He graduated with a bachelor’s degree in 1993 and in 1994 he won the Fifth Avenue Mile and took a bronze medal in the 1500-meter run at the Pan American Games in 1995. He has run a sub four-minute mile more than thirty times. He was inducted into the BYU Athletic Hall of Fame in 2006 and the Missouri Sports Hall of Fame in 2014. He is a member of The Church of Jesus Christ of Latter-day Saints and served a mission to Bolivia. This page was last edited on 3 April 2017, at 16:36.